Perinatal mental health illness encompasses mental health problems in women that arise during pregnancy and in the one year after childbirth. It is also concerned with the emotional and social development of babies and toddlers who can experience poor long term outcomes due to a lack of sensitive and responsive care. Perinatal mental health illness is the leading cause of death for women during pregnancy and in the year after birth, and causes significant ill health from depressive illness and anxiety as well as post-traumatic stress disorder. The level of provision of services nationally and locally is inadequate. Across Surrey services for perinatal mental health are limited and the nearest mother and baby in-patient services are located in Winchester (Hampshire). This chapter explores the issues around perinatal mental health illness and how local services respond to the level of need in the population. It discusses the risk factors for perinatal mental health illness in women and those for poor emotional and social development in babies and toddlers. A number of recommendations are made to commissioners of services from Surrey’s Clinical Commissioning Groups and Surrey County Council to improve provision of universal and specialised services for affected women and infants. The purpose of this JSNA chapter is to explore the issues around perinatal mental health illness and how local services respond to the level of need in the population. This chapter begins by explaining what perinatal mental health illness is, why it is an important issue, and why it deserves a chapter in the JSNA. This is followed by a description of the main risk factors that predispose women and infants to perinatal mental health (PMH) illness. The level of need within the population is estimated on the basis of the risk factors described and the proportion of the population that is potentially exposed to them. The chapter goes on to describe the current level of provision of services available to women and their infants before examining whether gaps exist in meeting the level of need locally. Throughout the chapter, links are made to related chapters which can provide more context for the concepts discussed. What is perinatal mental health illness? PMH is concerned with mental health problems in women that arise during pregnancy (the antenatal period) and in the one year after childbirth (the postnatal period). This could be a recurrence of an existing mental illness or a newly developing one. PMH also includes the mental health of the infant. Infant mental health is concerned with how well a child develops socially and emotionally from birth to 3 years of age (1). The mental health problems that women could experience during this time cover a range of conditions including depression, anxiety disorders, eating disorders, drug and alcohol-use disorders and severe mental illness (such as psychosis, bipolar disorder, schizophrenia and severe depression). Some women will have symptoms that fall below the threshold for considering treatment while others will have mild, moderate and severe mental health problems (2) . Some of these mental health conditions are described in more detail within Table 1 of this chapter and in the glossary towards the end of the chapter. Why is perinatal mental health illness important? PMH illness is important because it is one of the leading causes of death for mothers during pregnancy and in the year after birth. Between 10 and 20% of women develop a mental illness during pregnancy or within the first year after having a baby. The average cost to society of one case of perinatal depression is around £74,000, of which £23,000 relates to the mother and £51,000 relates to impacts on the child (3). Maternal suicides are now the leading cause of direct maternal deaths occurring within a year after the end of pregnancy. Between 2009 and 2014, 111 women died by suicide in the UK during or up to a year after the end of pregnancy (4). If untreated, perinatal mental illness can inhibit a mother’s ability to provide a baby with the sensitive, responsive care that he or she needs. This may be associated with poorer long-term outcomes for the child, even after the postnatal period (5). Why does perinatal mental health deserve a chapter in the JSNA? It is widely acknowledged that the provision of services for PHM nationally are inadequate and the local picture is not dissimilar. Despite it being well known that up to 20% of women will develop some mental health issues during the perinatal period, services across the UK, England and the South East Region are disparate, poor and in some cases non-existent. (6, 7) , About half of all cases of perinatal depression and anxiety go undetected and many of those which are detected fail to receive evidence-based forms of treatment. Specialist perinatal mental health services are needed for women with complex or severe conditions, but less than 15% of localities provide these at the full level recommended in national guidance and more than 40% provide no service at all. In Surrey, PMH has been recognised as a local issue for quite some time. As a result, the Adult Mental Health Strategy for Surrey and North East Hampshire 2014-2017 set out to prioritise the development of a Specialist Perinatal Mental Health service as one of its key outputs during the second and third year of implementation but this service has not been set up. It is also known that local specialist perinatal mental health services fall short of national standards and this is acknowledged in Surrey’s Joint Emotional Wellbeing and Mental Health Commissioning Strategy for Children and Young People 2014-17. In this section we discuss the individual factors that increase the risk of women developing a perinatal mental health illness followed by risk factors for poor social and emotional development in babies and toddlers. Women with a history of mental health problems before becoming pregnant are at increased risk of certain mental health conditions during pregnancy and in the year after childbirth (11,12) . If there is a higher than average rate of mental health problems in the local general population, there may be a higher level of maternal mental health problems as well. A high level of domestic violence could indicate an increased risk to the population of mental health problems in pregnancy and during the year after childbirth. Living in a household where domestic violence is occurring is also a risk factor for poor mental health in babies and toddlers (14). ONS statistics show that infant mortality rates are higher among babies that are sole registered (i.e. those whose father does not appear on the birth certificate) compared to other registration types(15). The relationship between sole registration and birth outcomes is a complex one involving socio-economic and lifestyle risk factors that are known to have an impact on maternal health (16). There is no reliable local data available on parent-baby attachment but other risk factors such as drug and alcohol misuse can also lead to attachment problems. If a parent or caregiver misuses alcohol or drugs, there can be an impact on a baby or toddler’s development, often due to parenting problems. Parents misusing substances are at risk of a wide range of difficulties associated with their role as a parent. These may include a lack of understanding about child development issues, ambivalent feelings about having and keeping children and lower capacities to reflect on their children’s emotional and cognitive experience (21). NICE guidance stresses the importance of taking account of the impact of the parent’s drinking on the parent–child relationship and the child’s development, education, mental and physical health, own alcohol use, safety, and social network (22) . The National Treatment Agency for Substance Misuse (19) found that during 2011/12, one third of adults in drug or alcohol treatment lived in a household with children (including parents living with their own children and adults living in a house with children who are not theirs, for example step-children or grandchildren). Parents who live with their own children tend to have fewer drug-related problems than others in treatment, are less likely to use the most addictive drugs, and are less likely to inject drugs when compared to non-parents in treatment. They are also less likely to be homeless or arrive in treatment via the criminal justice system (24). see JSNA chapter: Substance misuse. The social and emotional wellbeing of a baby or toddler can be affected by whether the mother has a mental health problem herself, often due to the effect on the mother-baby relationship(2,12, 25) . Emotional distress and problems during pregnancy, childbirth and the postnatal period warrant particular attention because of the longitudinal impact these difficulties have on the developing foetus and new-born baby, effects which are often mediated through the woman’s disrupted relationship with her infant (26). Pregnancy in under-18 year olds can lead to poor health and social outcomes for both the mother and child(27) . For example, children born to teenage parents are at greater risk of low educational attainment, emotional and behavioural problems, maltreatment or harm, and illness, accidents and injuries (28) . Young mothers are also more at risk of developing postnatal depression than average(29) . In this section we describe the level of need in the local population using estimates of the population affected by the risk factors described in the previous section. Due to limitations in the collection and availability of data, some of the risk factors do not have any estimates available at a local level or where data is collected locally, there may not be comparable regional or national data. 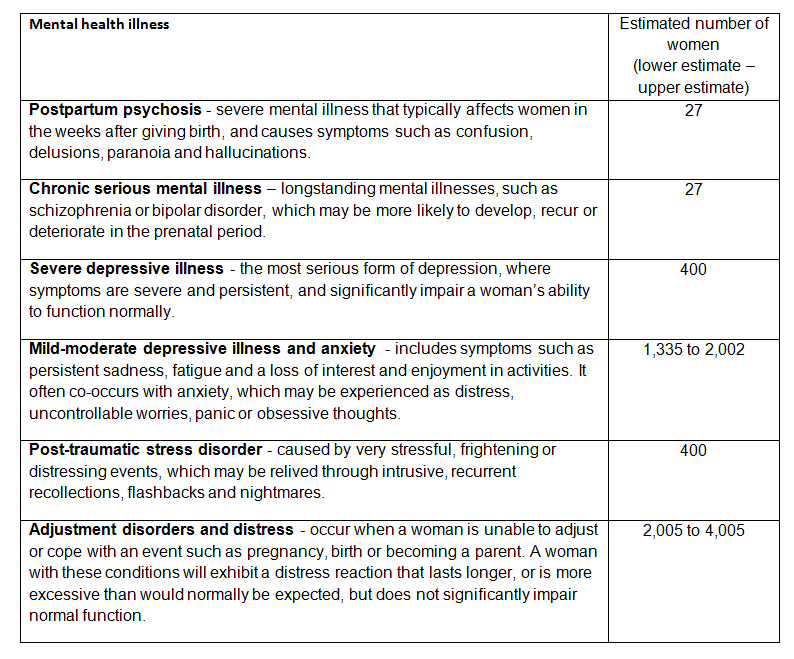 The estimated number of women with mental health problems during pregnancy and after childbirth for Surrey are shown in the Table 1. Adding all of these estimates together will not give a total estimate of the number of women with perinatal conditions in the Surrey, as some women have more than one of these conditions. (30) This table provides the most important predictor of the level of need for specialist perinatal mental health services. Source: ONS, 2016. Number of Maternities in Surrey in 2015 = 13,349. Centre. Source of rates of disorders: Joint Commissioning Panel for Mental Health. Guidance for commissioners of perinatal mental health services(31). Definitions from NSPCC(11). A stillborn baby is one born after 24 completed weeks of pregnancy with no signs of life. The stillbirth rate is the number of stillbirths per 1,000 total (live and still) births. In 2014 there were 62 stillbirths in Surrey, a rate of 4.6 stillbirths per 1,000 total births (live + stillbirths). The rate was the same for England but higher compared to the South East region (4.4 stillbirths per 1,000 total births). The data visualisation shows that the rate of stillbirths in Surrey has risen to exceed the regional rate and equal the national rate. If this trend continues, Surrey will become worse than the national average. A high rate of stillbirths may increase the need for mental health services due to the association particularly with post-traumatic stress disorder. There was a 0.4% increase in the number of live births across England and Wales between 2014 and 2015 (ONS, 2016). The infant mortality rate is the number of infants dying before their first birthday per 1,000 live births. 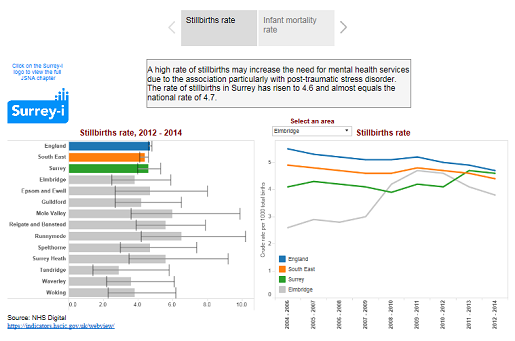 The rate of infant mortality in Surrey is lower than regionally and nationally but appears to be improving at a much slower pace (see data visualisation). There were 107 infant deaths in Surrey in the period 2013-2015: an infant mortality rate of 3.12 per 1,000 births. Nationally the rate was 3.89. 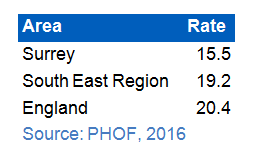 Table 2 shows the rate of domestic abuse recorded by police in Surrey per 1,000 population, with regional and national comparisons. The rates relate to all incidents, not only those involving households containing children or pregnant women. In line with national trends, this rate has gradually risen since 2010/10. The negative consequences of living in a household with violence affects both pregnant women and infants. The number of births which were registered by just the mother provides a rough indication of the number of women in that are likely to lack the support of the father during pregnancy and as a new mother. Table 3 shows the proportion of births that were sole registrations. Table 4 shows the number and proportion of parents receiving drug and alcohol treatment in Surrey who live with children. The proportion of substance misusers who seek treatment is likely to vary according to relative levels of deprivation as well as other factors such as employment opportunities and provision for treatment. This doesn’t give any indication of the numbers of parents in Surrey who misuse drugs and alcohol who are not in treatment. Table 5 shows the number and rate of live births to mothers under 18 years of age in Surrey. Not all babies born to teenage parents will be brought up by them. Also, although a high number of teenage parents in a population is a risk factor for higher levels of poor infant mental health, on an individual level many teenage parents will parent effectively and raise healthy children. Younger adult parents (those in their late teens or early twenties) may need extra support, especially those who are vulnerable or lack family support. A total of 870 children were under the care of the local authority at the end of 2016, and 125 (15%) of them were under the age of 5 years. Very young children require decisive action about their placement moves due to the impact this has on emotional attachment. Figure 1 shows the rate of looked after children in Surrey. It is consistently lower than the regional and national rates. Table 6 shows the number of children on a child protection plan. This can be used as an indicator of the numbers of children that have experienced maltreatment and are known to authorities. Table 7 shows the number of homeless families which include children or a pregnant woman. The number of homeless people in priority need, and those accommodated in temporary accommodation in Surrey has been rising since 2008/09. The estimates for the number of women affected by perinatal mental health illnesses in Surrey in a single year were; between 2,000 to 4,000 with an adjustment order or distress; 1,300 to 2,000 experiencing mild to moderate depressive illness and anxiety, 400 with severe depressive illness; and 400 with post-traumatic stress disorder. The rate of stillbirths in Surrey has risen to exceed the regional rate and equal the national rate. If this trend continues, Surrey will become worse than the national average. A high rate of stillbirths may increase the need for mental health services due to the association particularly with post-traumatic stress disorder. The level of domestic abuse in Surrey may be marginally lower than nationally and regionally, but the numbers of incidence involved are still significant. Mental health issues arising from domestic abuse may result in the increased demand for services and resources from a variety of stakeholders other than healthcare e.g. social care. The high rate of parents in drug and alcohol treatment in Surrey could mean that there is a high level of engagement with treatment services, but could also mean that there is a high level of substance misuse and potentially a high number of children at risk of harm as a result of their parents. A significant number of number of women are estimated to experience depressive illness, anxiety, adjustment disorder and distress in Surrey each year. There is no readily available information on how many of these women are able to access services or where the majority are seen within the mainstream services. The rate of family homelessness in households containing children appears to be less of a problem in Surrey than nationally, but the actual number of households is considerable. More information is needed about the age profile of the children in these households to determine whether there is a potential risk to their social and emotional development. In this section we describe the current level of service provision in Surrey to assess whether services are meeting the level of need in the population. The lack of routine central data collection historically across services for perinatal mental health presents a challenge in providing a detailed analysis of our local picture. Table 8 shows the services which are available currently, and where the gaps are across Surrey and NE Hampshire. 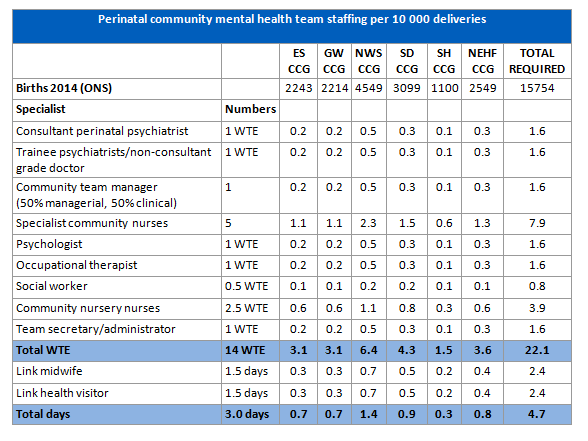 Table 9 shows the workforce that would be required for a Surrey and NE Hampshire and Farnham specialist community perinatal service against the Royal College Psychiatrists recommended workforce. Comparing the two tables demonstrates a huge gap between the staffing levels from various disciplines that would be available in commissioned specialist service compared to what is available currently through mainstream services. Source: Royal College of Psychiatry(32). Estimated using ONS Total Births per CCG, 2014. Across Surrey there are very limited services for perinatal mental health. The nearest mother and baby in-patient services are located in Winchester (Hampshire). There is no local specialist perinatal mental health community service and not all of the acute trusts or community providers have perinatal mental health midwifes or health visitors. Mainstream services currently provide all the care for women during the perinatal period and some roles and pathways have been developed to prioritise pregnant women or those with a baby. 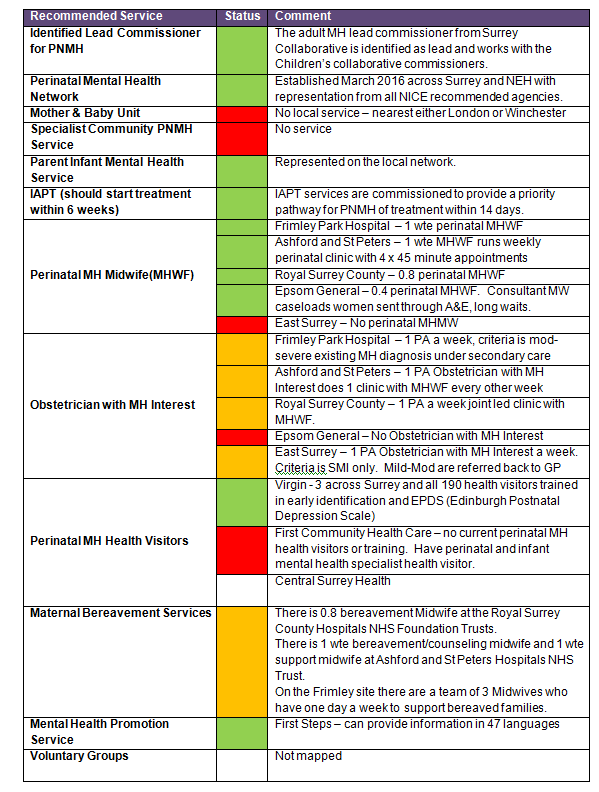 Surrey has no local specialist perinatal mental health services commissioned as a unified service. (12) This means that local standards for perinatal mental health services locally fall short of national standards. In this section we describe what a specialist perinatal mental health service looks like and the range of services that should be available to women. We also itemise the facets of a good specialist perinatal mental health service based on best practice and commissioning guidance. A list of national policy initiatives and evidence is provided for reference to help those who commission services as well as those involved with the assessment, referral or treatment of women. What is a specialised perinatal mental health service? Specialised perinatal mental health services encompass both community teams and inpatient Mother and Baby Units (MBUs). Community teams should be commissioned by CCGs on a locality basis but MBUs are highly specialised services focused on the treatment and recovery of women with the most severe and complex mental ill health. In-Patient Mother and Baby Units enable the treatment and recovery of the mother whilst ensuring the developing relationship with the baby and its physical and emotional wellbeing. Units will have a specialised Perinatal Outreach function that provides assessments for women who would otherwise be admitted to the MBU, facilitates early discharge, the prevention of relapses and re-admission of discharged in-patients and of high risk (and admission vulnerable) women. In some areas this function may be provided by a community team commissioned by CCGs. MBUs are staffed by clinicians with additional knowledge and skills in the impact of childbirth on maternal psychiatric disorder and the effects of maternal psychiatric disorder and its treatment on the infant both in-utero and after birth. Be based on a perinatal mental health strategy which includes a commissioning framework and service design for populations large enough to provide a critical mass for all the services required across a clinical pathway. The following evidence based national policy initiatives recommend that all women with serious mental illness in late pregnancy and the postpartum period should receive specialist perinatal psychiatric care. If they require admission, these women should be admitted with their babies to a Specialised In-Patient Mother and Baby Unit. They also recommend treatment and management guidelines for perinatal conditions and women of reproductive potential. Their aim is to reduce morbidity and mortality in mother and infants and to improve quality of life and patient satisfaction. Women in Surrey should be able to access specialist perinatal mental health teams and inpatient units when necessary. A specialist perinatal mental health service should be commissioned in accordance with NICE Guidance in order to meet the needs of women. CCG commissioners should work together with NHS England Specialised Commissioning in order to ensure that specialised perinatal Mother and Baby Units are made available more locally to Surrey. Universal services (especially GPs, midwives and health visitors) should be supported to identify issues early on and ensure that all women get the support they need before the postnatal period. In the absence of a specially commissioned perinatal mental health service, commissioners and providers should reliably and systematically collect timely data on perinatal mental illness across Surrey in order to inform strategy and service developments. For example, adult mental health services, including IAPT, could routinely collect data on whether patients are pregnant or parents, and the ages of their children. Commissioning and funding arrangements for specialist perinatal mental health services must support preventative work. Only a small number of women are at risk of developing serious mental illness, but the vast majority will have mild to moderate depressive illness which may go undetected. With the proper care from expert services, further episodes of mental illness in these women can be prevented. To do this work, specialist mental health services must be able to work with women who are currently well and would not normally meet the thresholds for care. There should be adequate commissioning of parent-infant interventions and that these are well publicised to GP practices and mothers and integrated within integrated care pathways. Surrey County Council should ensure that they include at least one Specialist Health Visitor Perinatal and Infant Mental Health (PIMH). Whilst health visitors, through their ‘universal’ service, are best placed to identify those families requiring additional support, they have many other roles to fulfil and would benefit from specialist support from a specialist health visitor PIMH. All health visitors should receive pre and post-registration education in perinatal and infant mental health. This will enable them to identify, prevent and intervene early in the care of women with mental health problems. Alongside this knowledge, training must also equip health visitors with the skills and confidence to talk with women and their families about their mental health.34 The Surrey and NE Hampshire Perinatal Mental Health Network already has it in their objectives to ensure that a Perinatal training strategy for the workforce involved is developed and delivered. A Surrey-wide perinatal mental health strategy should be developed which includes a commissioning framework and service design for all the services required across the clinical pathway. Strategy development should involve participation from all providers of care for perinatal mental health. Services should address the impact of perinatal mental health illness on babies and other family members. In order to do this, commissioners should work closely with patient groups to seek views of patients and family members. This will enable provision of sensitive and responsive care and identify opportunities for linking families with further sources of support. 3.Annette Bauer, Michael Parsonage, Martin Knapp, Valentina Lemmi & Bayo Adelaja. (2014). The Costs Of Perinatal Mental Health Problems. London School of Economics and Centre for Mental Health. 5. Nulman, I., Rovet, J., Stewart, D.E. et al. (2002) Child development following exposure to tricyclic antidepressants or fluoxetine throughout fetal life: a prospective, controlled study. American Journal of Psychiatry159 (11), 1889-1895. 8. Agnieszka Klimowicz, Beverley Lignum (2016) Perinatal Mental Health Scoping Paper and Recommendations. South East Strategic Clinical Networks. 13. Howard LM, Oram S, Galley H, Trevillion K, Feder G. Domestic violence and perinatal mental disorders: a systematic review and meta-analysis. PLOS Medicine. 2013;10 (5):e1001452. doi: 10.1371/journal.pmed.1001452. 16. Graham J, Creegan C, Barnard M, Mowlam A and McKay S (2007) Sole and joint birth registration: exploring the circumstances, choices and motivations of unmarried parents. Research Report No. 463. 35. Royal College of Psychiatry. http://www.rcpsych.ac.uk/healthadvice/moreinformation/definitions/diagnosesorconditions.aspx Accessed on 29/12/2016 at 1553hrs.